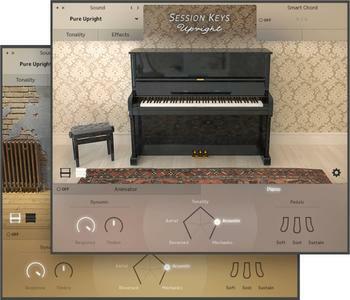 The Gentleman is a sampled instrument based on an upright piano from 1908. This piano has survived with all the original parts intact, and you can hear this turn-of-the-century character in the recordings. With a sound both delicate and expressive, The Gentleman is the only upright you'll ever need. The Gentleman's extensive tweaking options make it perfect for all contemporary productions. Control levels of pedals, damper, string, and hammer sounds. Adjust timbre with the Color knob. Turn the Dynamic knob to change the dynamic range. The Lid control adjusts brightness. And built-in effects let you fine-tune the sound without ever leaving the interface. The Gentleman boasts 2,300 individual samples and 16 velocity zones allow each note to come through with stunning realism. As with all the Definitive Pianos, separate overtone and resonance samples let the piano's natural vibrations sing. Even key releases were sampled in nine velocity layers.